We are a leading supplier of quality fabric, wallpaper and paint from manufacturers such as Zoffany, Colefax & Fowler and Osborne & Little. 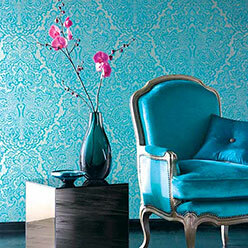 Exciting and innovative wallcoverings, stunning designs, contemporary or traditional are available to order. Samples can be sent directly to your home for your approval before purchase. Please view our range of suppliers below. Comprehensive range fabrics inc. prints, upholstery, sheers, silks, leathers. Contemporary & traditional wallpaper & its famous traditional archive prints. Design and manufacture of furnishing, fabrics and wallpapers. Inspirational design, innovative textures and delicious colours. Yarn dyed, printed, embroidered, applique and patchwork fabrics for upholstery, bedding and furnishing applications. Leading fabric and wallpaper designers. Design and manufacture of woven, yarn dyed, finished and embroidered fabrics for upholstery and furnishing. A French fabric house internationally renowned for the quality of its textiles and for its use of vibrant colour. British design company renowned world-wide for its craftsmanship and quality. Beautifully coordinated weaves and prints. Fine linens are sprinkled with a mist of silver, gold or copper. Designs and weaves distinctive fabrics, many of which take their inspiration from the natural splendour and breath-taking colours of the surrounding Scottish Highlands. Timeless cotton and linen prints, along with a good selection of wool. Inspired by rich traditions of the past, Zoffany's collections are designed to look equally at home in today's contemporary interiors. 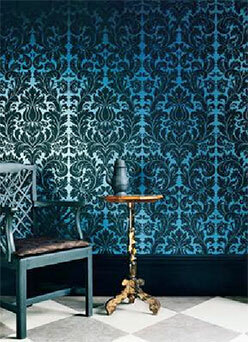 Contemporary & traditional wallpaper & their famous traditional archive prints. 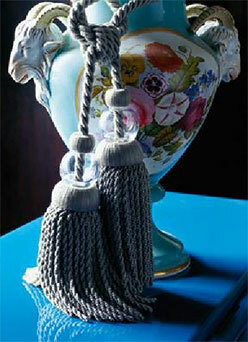 Exquisite tie-backs and trimmings to suit every design and specification from creatively contemporary to conservatively classical. Contempoary and period textiles, wallpapers and trimmings. A french company of international recognition, a family run business specialising in the creation of trimmings and design of decorative curtain poles, decorative curtain poles, decorative fabrics as well as accessories.